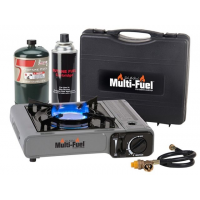 Can Cooker Base Camping Propane Stoves Multi-Fuel Cooktop Single Burner Gray/Black SMDF1401. Features an electronic ignition and ultra-quiet operation. Uses standard 8 oz. butane and 16.4 oz. propane canisters (not included). Includes carry/storage case.